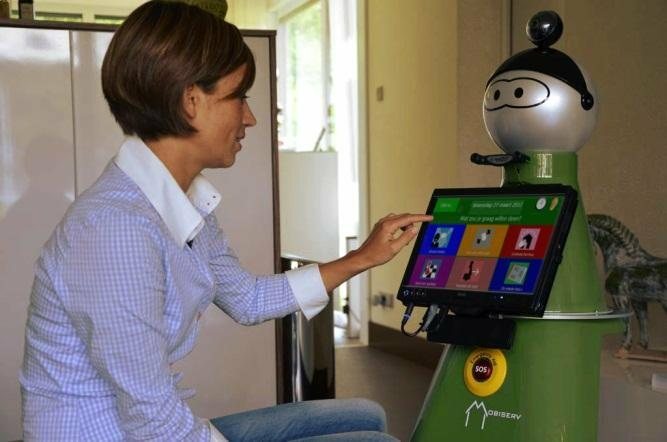 A consortium of European researchers has developed a customizable robot companion for people with memory or mobility problems. The robot, a mobile wheeled semi-humanoid figure equipped with cameras, sensors, audio and a touch screen interface, can remind users to take their medicine, suggest they have their favorite drink or prompt them to go for a walk or visit friends if they haven’t been out for a while, and alert emergency services if something is amiss. Developed over 33 months by a consortium of European research institutes, universities and technology companies in seven countries — Finland, France, Greece, Italy, the Netherlands, Switzerland and the United Kingdom — the companion robot is just one of several results of an EU-funded project, An integrated intelligent home environment for the provision of health, nutrition and well-being services to older adults (MOBISERV), which received EUR 2.75 million in research funding from the European Commission. ‘This has been a very broad project, we’ve worked not only on the robot but also integrating it with a smart-home system and with smart clothes,” said Herjan van den Heuvel of Smart Homes, the Dutch Expertise Centre on Home Automation and Smart Living, which oversaw the robot’s development. The smart-home environment consist of smart sensors, optical recognition units, and home automation elements, to detect, amongst other things, eating and drinking patterns, activity patterns, and dangerous situations. It also includes smart fabrics, which can take the form of wearable garments or even bed sheets, include a variety of tiny lightweight wireless sensors to monitor vital signs or sleeping patterns, and can even detect if the wearer falls over. Based on state-of-the-art artificial intelligence and robotics technologies, the MOBISERV robot companion is designed mainly to offer cognitive support to users, offering reminders and suggestions to help them lead healthy and socially active lives. ‘The way the robot behaves, what it says, how it says it, even the tone of voice can be customized for each person,” says Van den Heuvel. The MOBISERV team created an easy-to-use interface to configure the robot so a carer, partner, family member — or someone else who knows the user well — can personalize it for their individual needs and preferences, setting everything from the robot and user’s name to the user’s preferred drink, their friends and the type of character the robot should have. In the future, the researchers also envision being able to customize the design and color of the robot. Professional care providers also saw the advantages, though they tended to be somewhat more skeptical. The prototype MOBISERV robots currently cost around EUR 10,000 to build, but that price should fall as technology advances, and through economies of scale if they are produced in large numbers. Van den Heuvel envisions a robot companion costing around EUR 5000 within a couple of years. The MOBISERV partners are currently seeking funding for follow up projects or a joint spinoff to further enhance and perfect their design, as well as conduct user trials on a larger scale. MOBISERV received research funding under the European Union’s Seventh Framework Program.